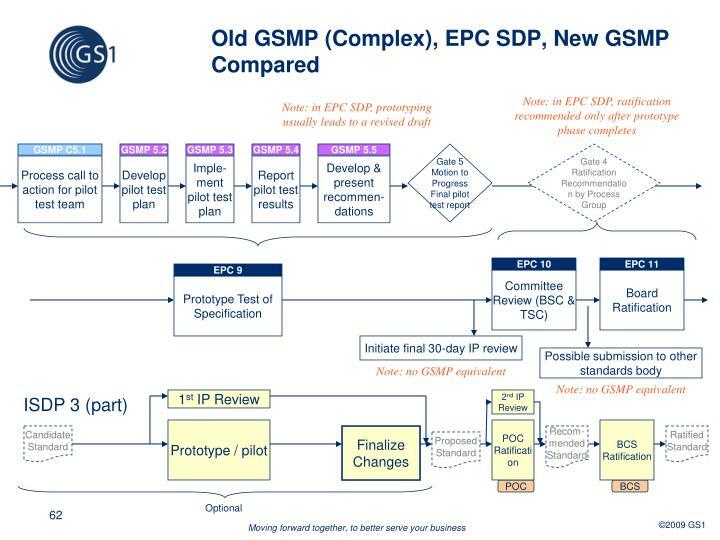 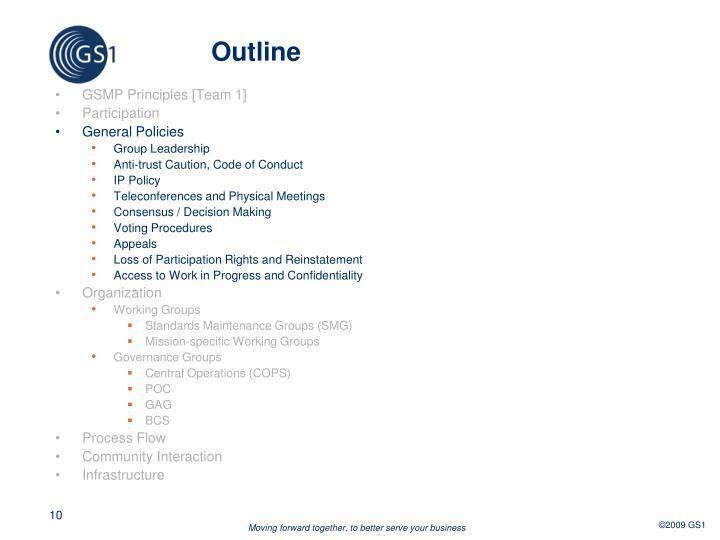 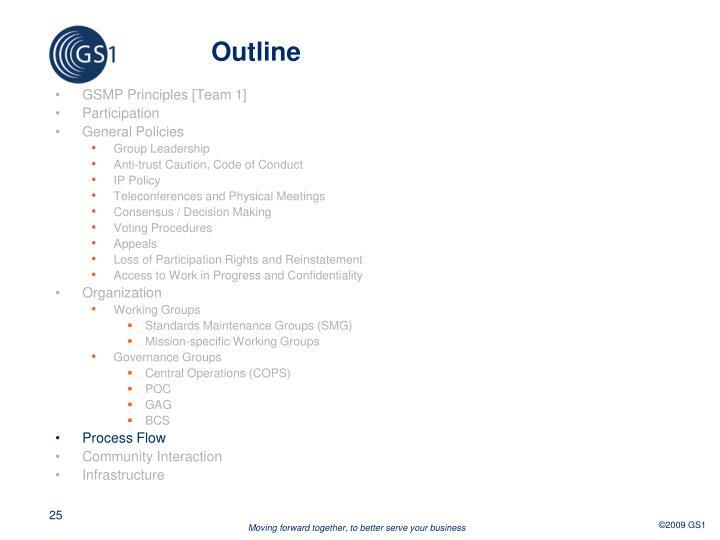 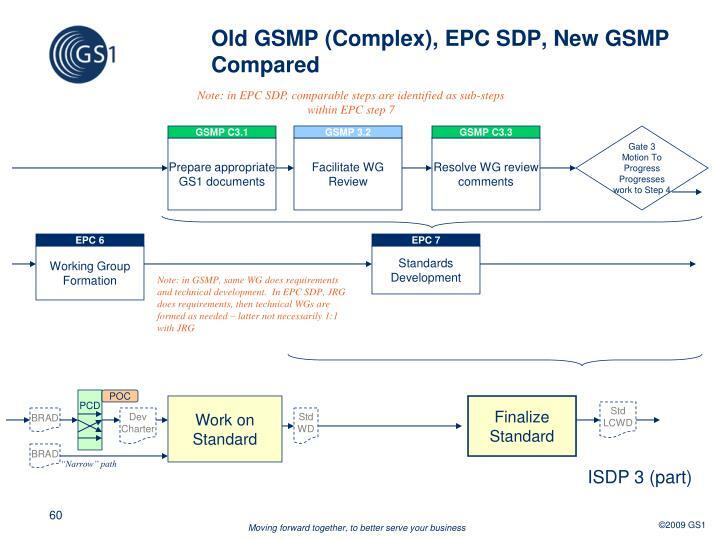 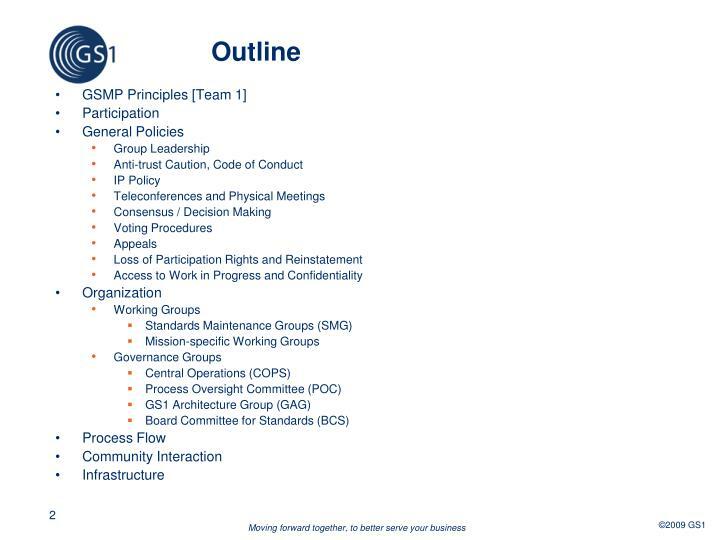 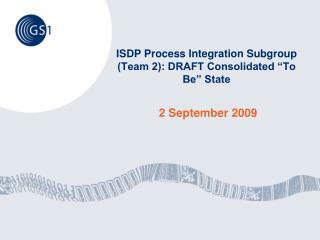 Group responsible for carrying out the system development work of GSMP, including development of GS1 Standards, Guidelines etc. 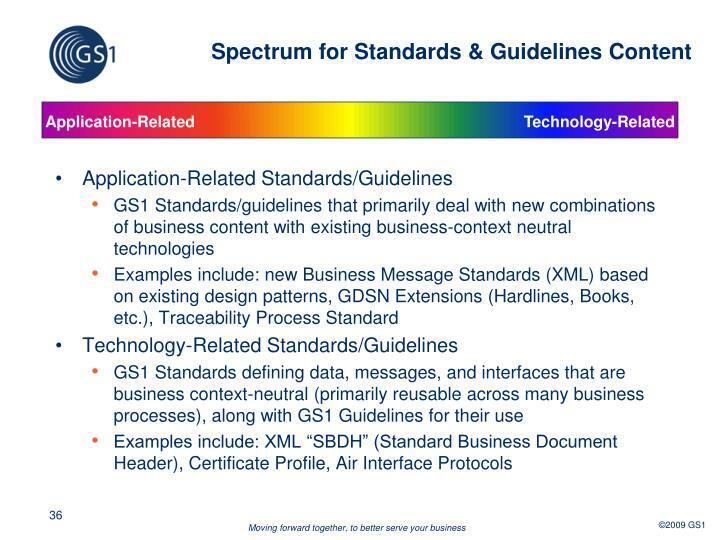 Does not define standards, guidelines, etc. 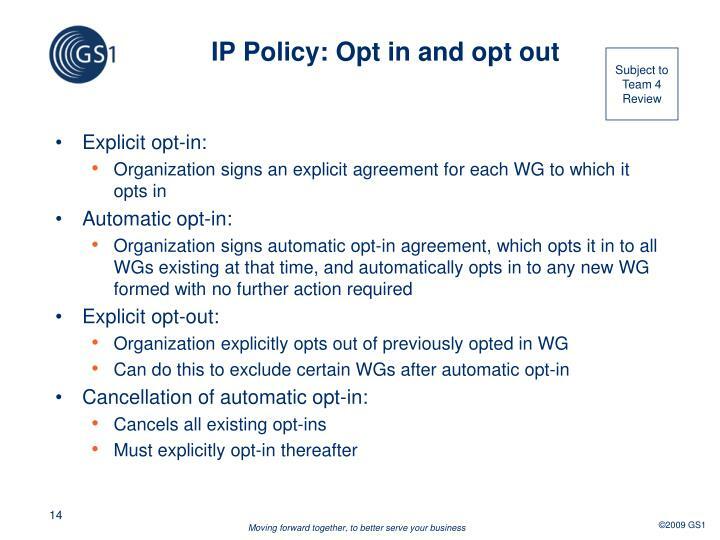 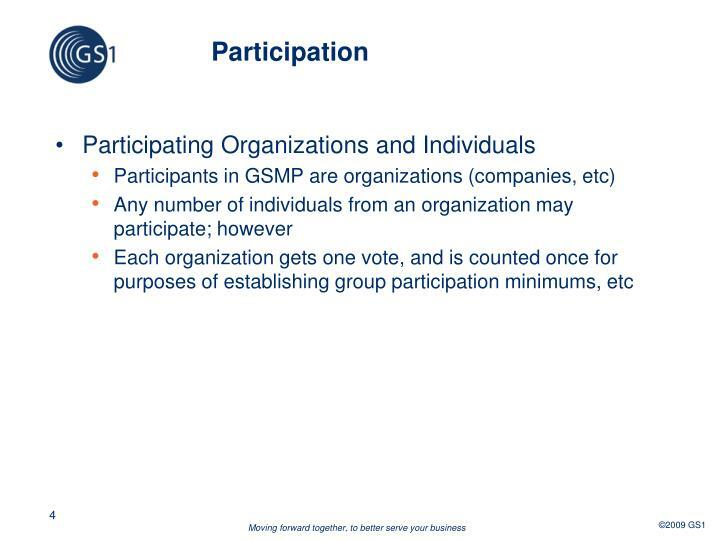 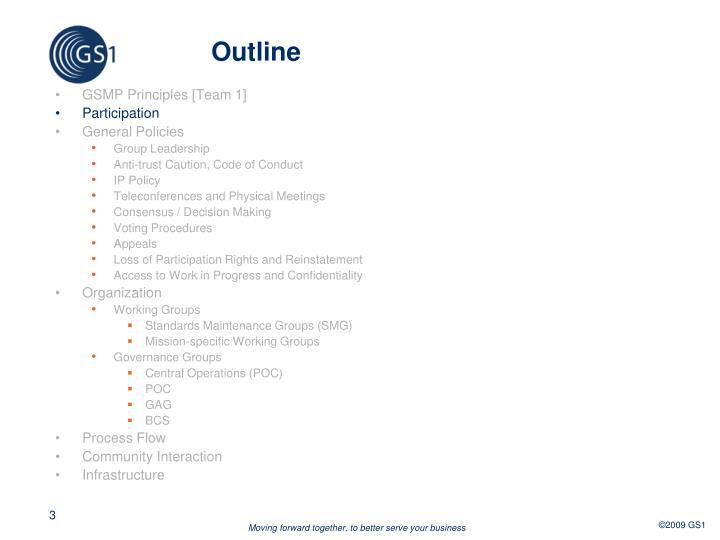 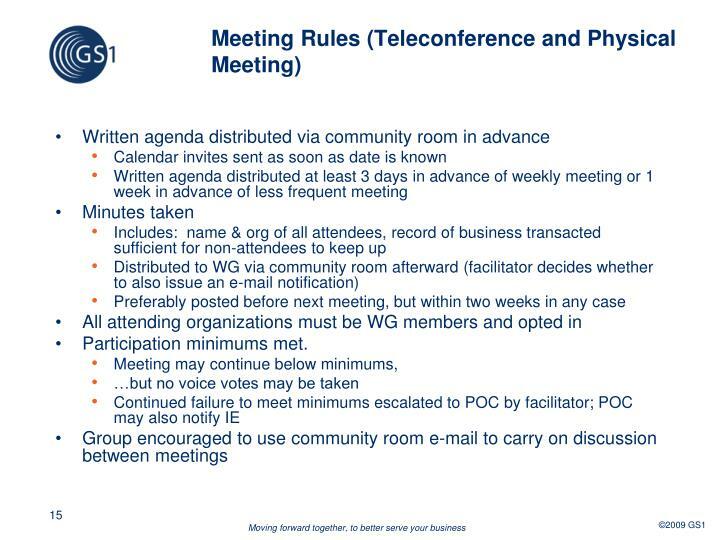 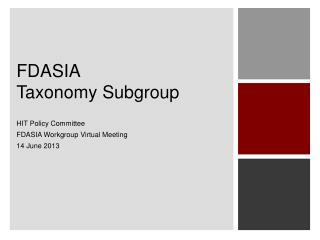 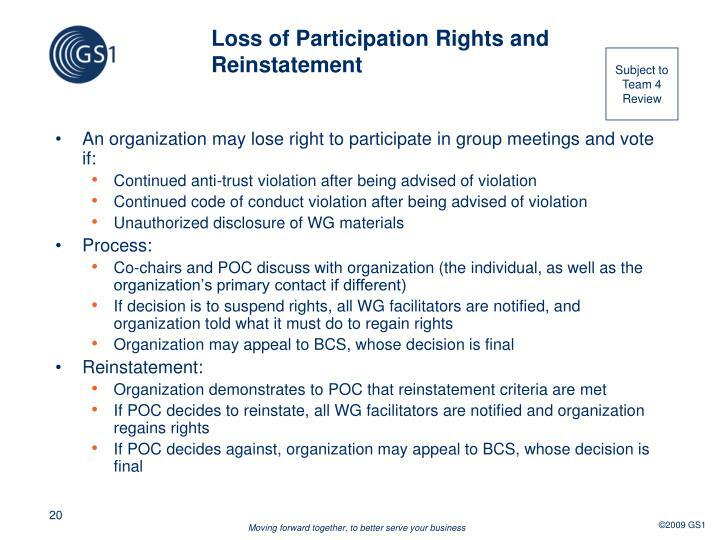 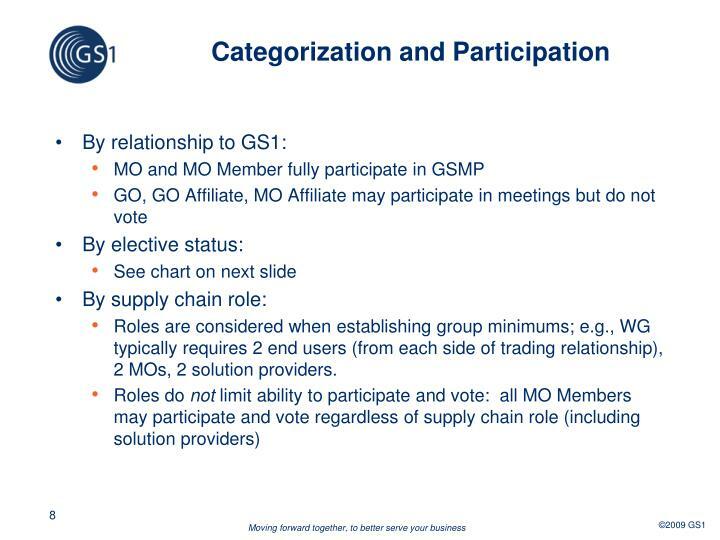 Roles are considered when establishing group minimums; e.g., WG typically requires 2 end users (from each side of trading relationship), 2 MOs, 2 solution providers. 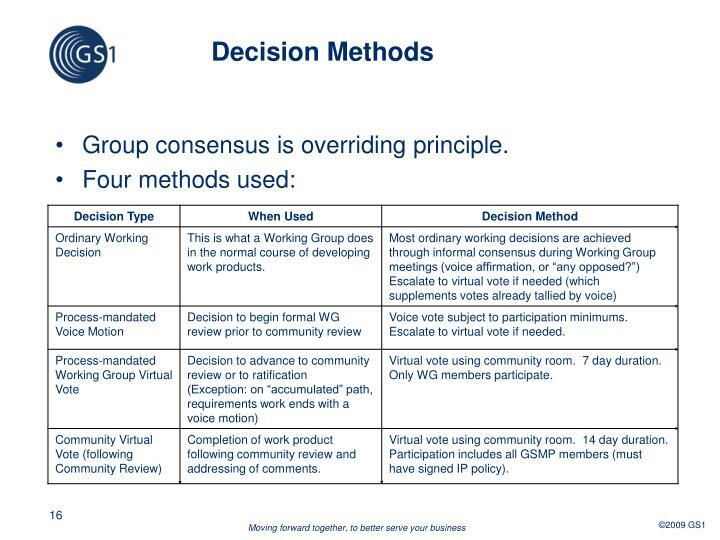 Group consensus is overriding principle. 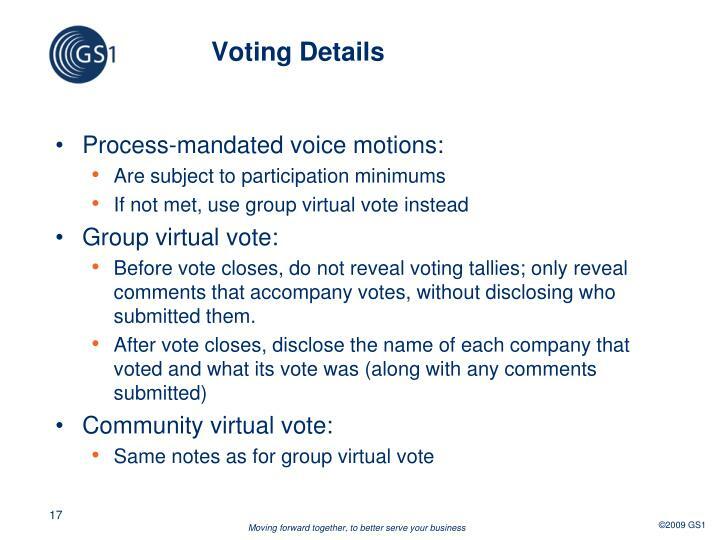 Before vote closes, do not reveal voting tallies; only reveal comments that accompany votes, without disclosing who submitted them. 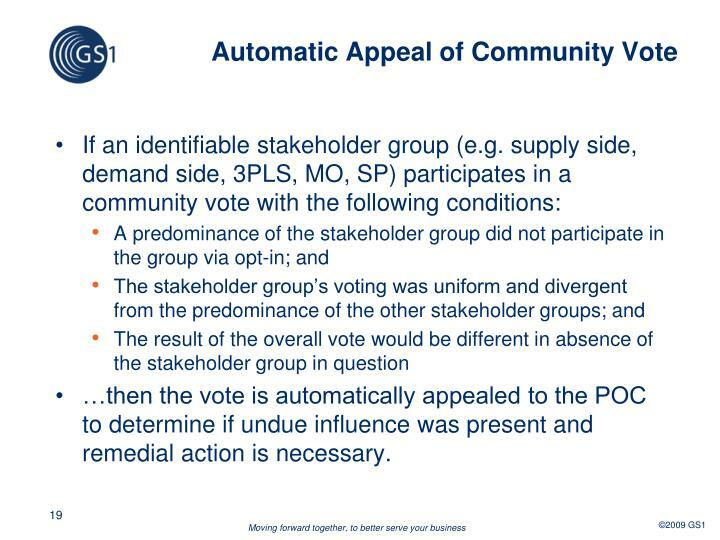 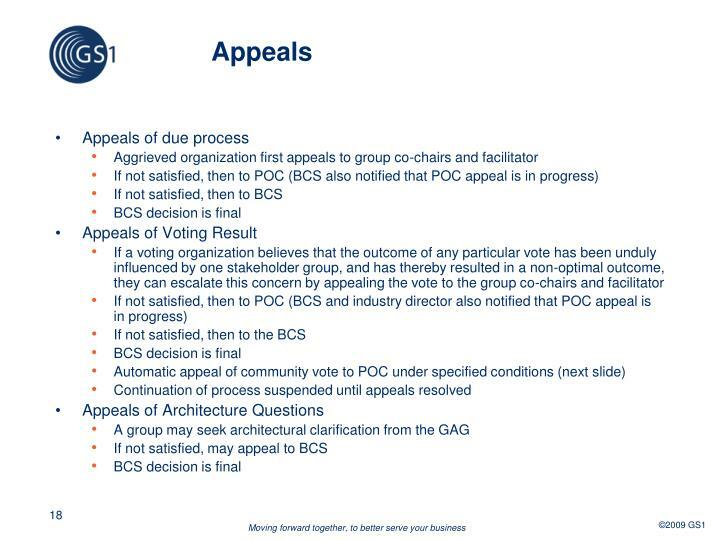 …then the vote is automatically appealed to the POC to determine if undue influence was present and remedial action is necessary. 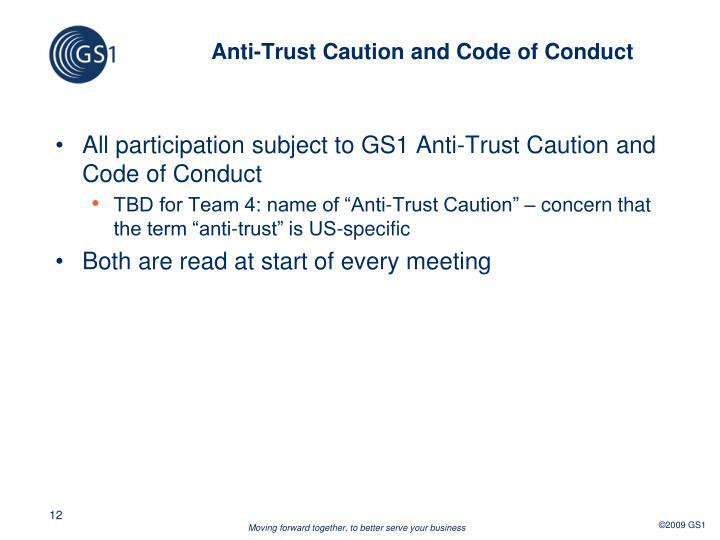 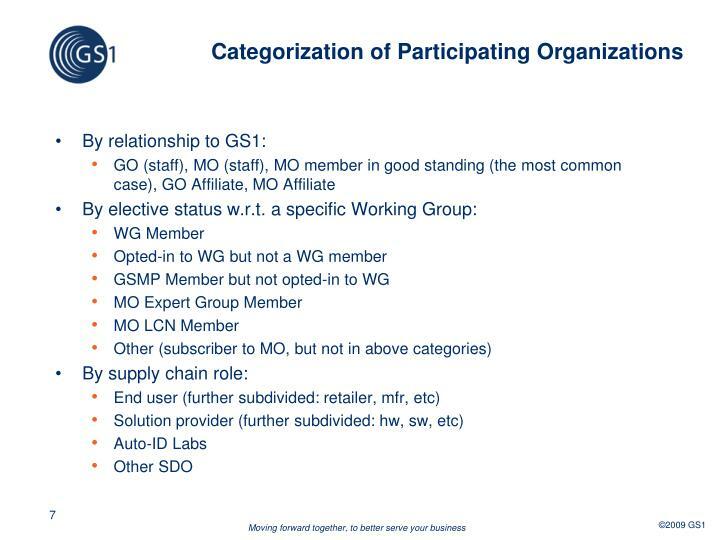 All ratified standards, guidelines, etc, are available to the general public on the GS1 website in the Knowledge Center. 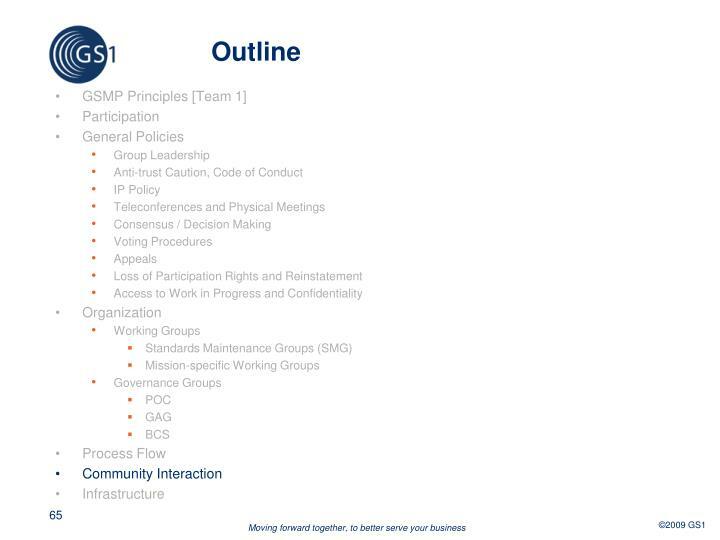 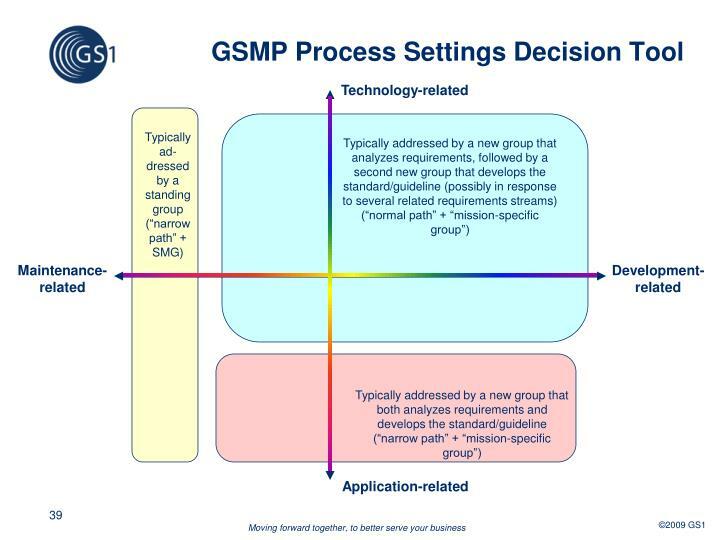 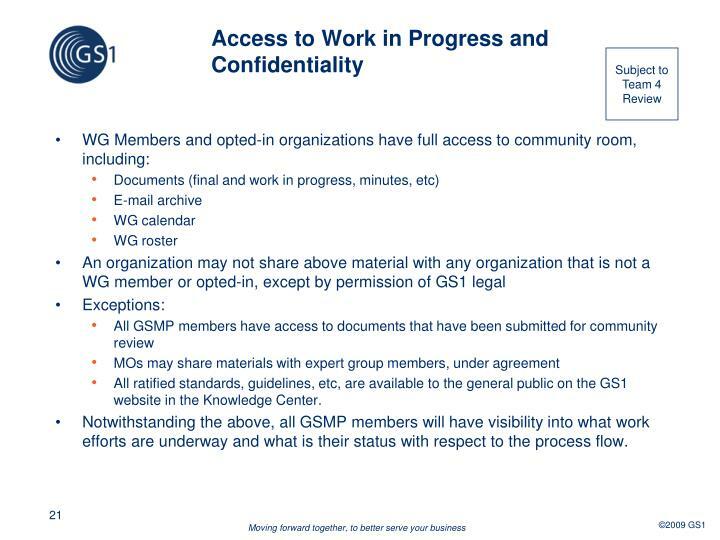 Notwithstanding the above, all GSMP members will have visibility into what work efforts are underway and what is their status with respect to the process flow. 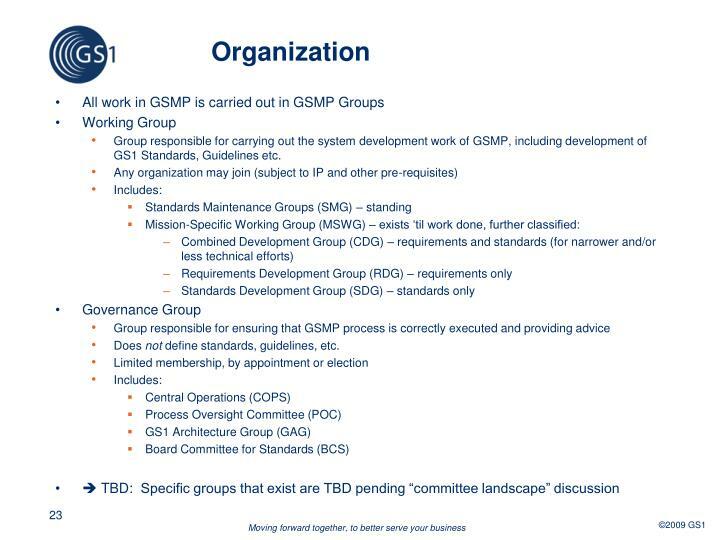 In some cases, for example a mission-specific group working on a brand new area of standards, there may be no related SMGs; this is expected to be rare. 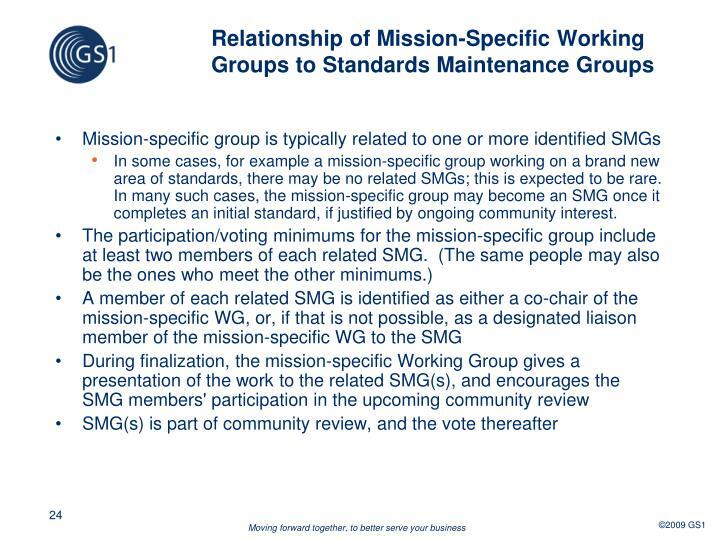 In many such cases, the mission-specific group may become an SMG once it completes an initial standard, if justified by ongoing community interest. 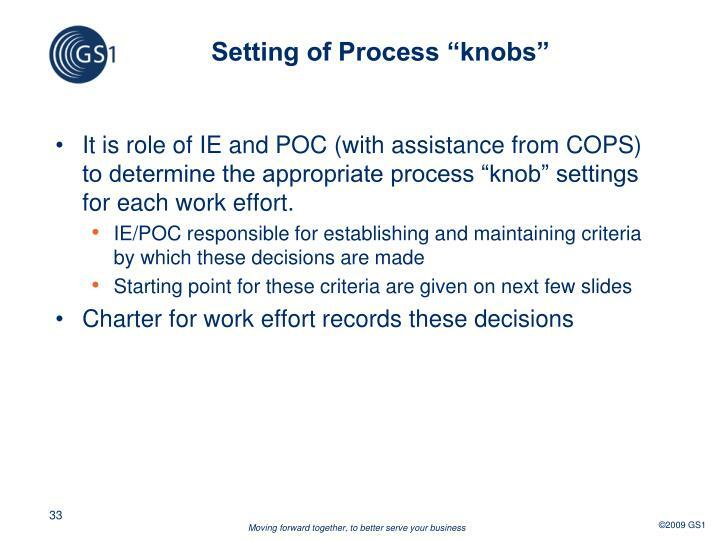 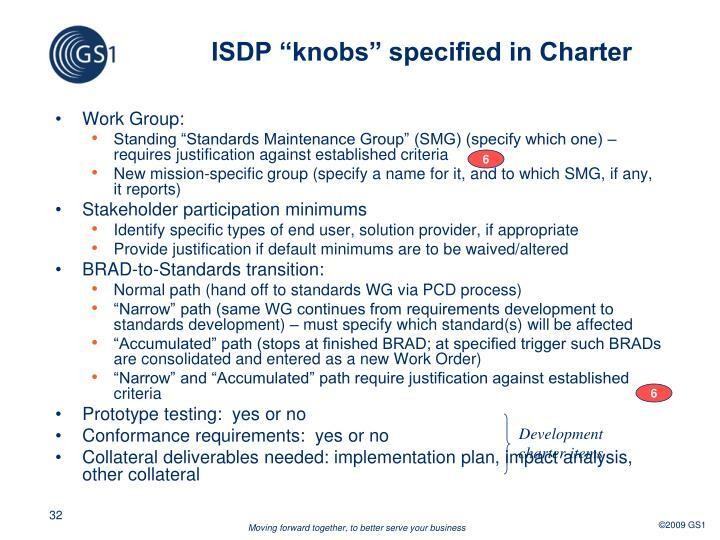 It is role of IE and POC (with assistance from COPS) to determine the appropriate process “knob” settings for each work effort. 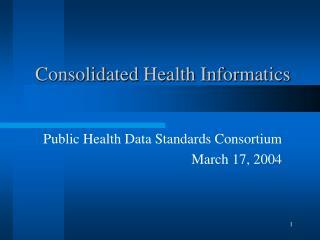 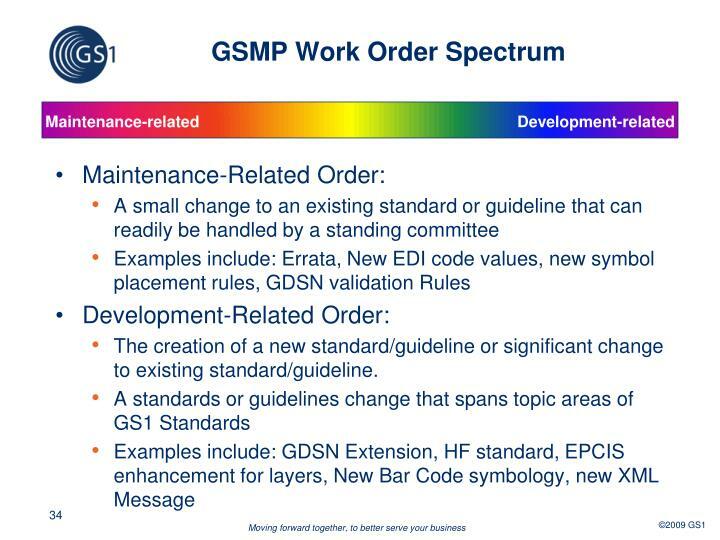 The creation of a new standard/guideline or significant change to existing standard/guideline. 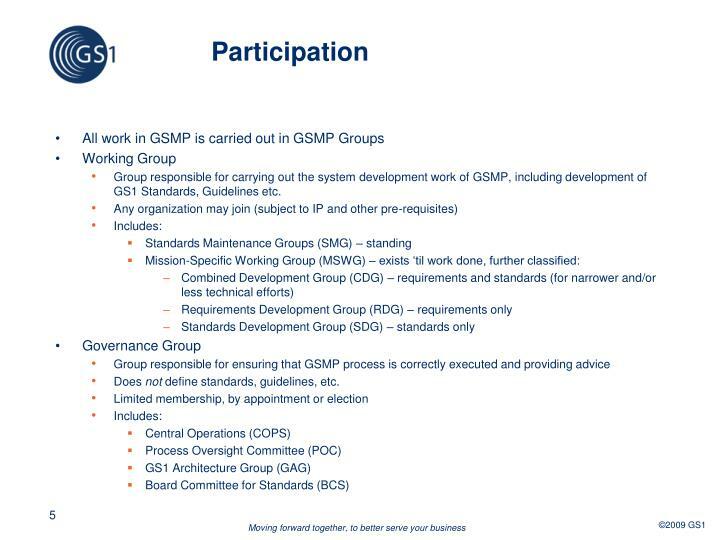 These terms are intended to give broad awareness of the nature of work in a given group. 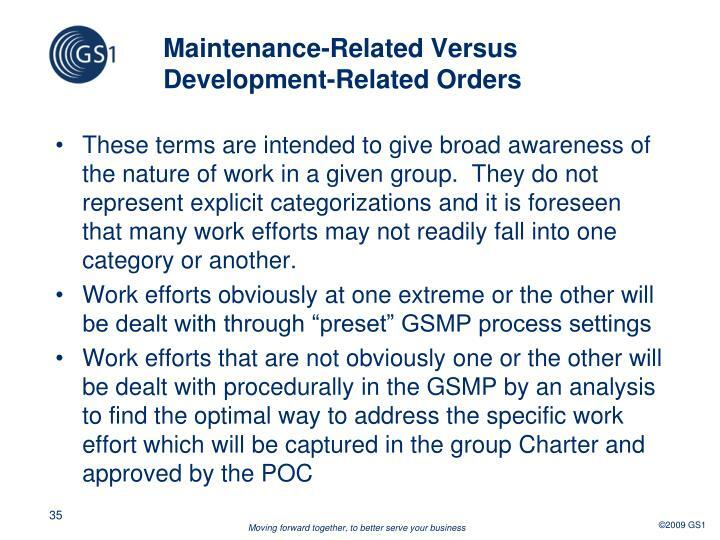 They do not represent explicit categorizations and it is foreseen that many work efforts may not readily fall into one category or another. 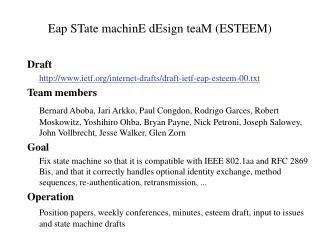 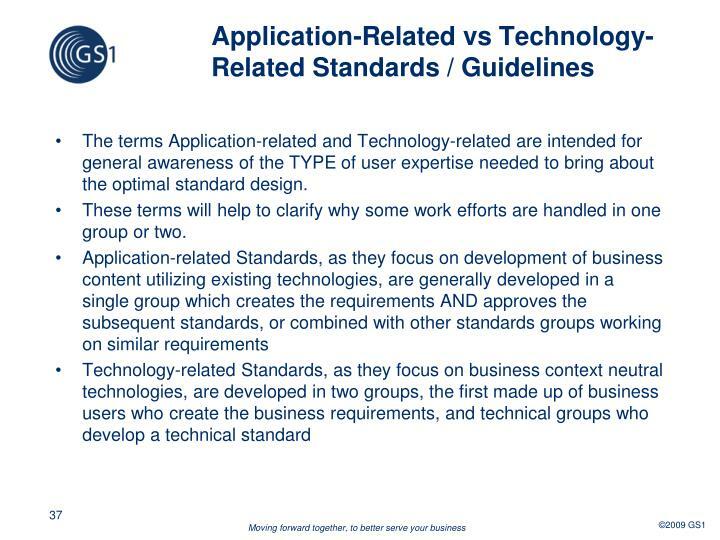 The terms Application-related and Technology-related are intended for general awareness of the TYPE of user expertise needed to bring about the optimal standard design. 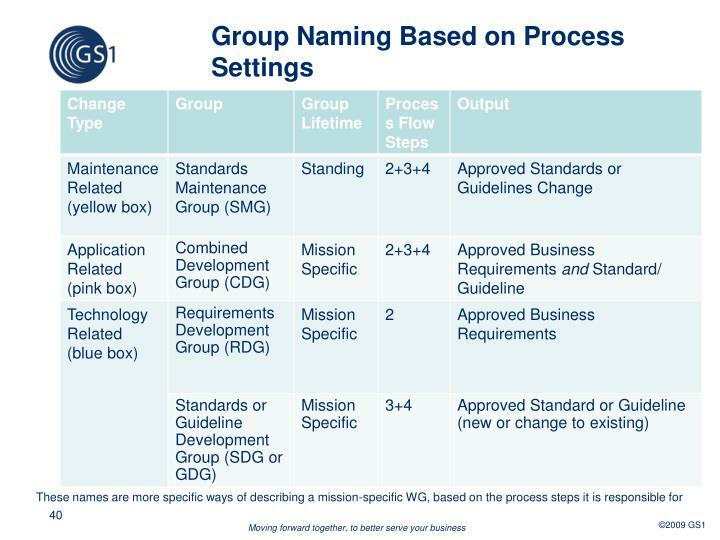 These terms will help to clarify why some work efforts are handled in one group or two. 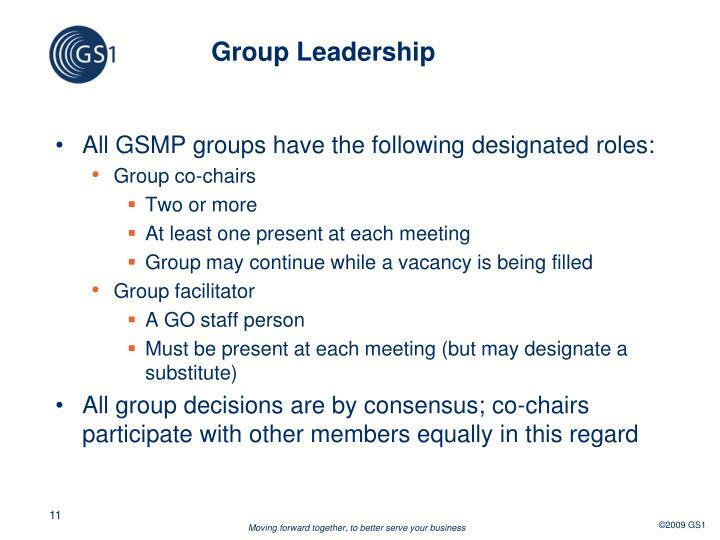 As earlier stated, these terms are intended to give broad awareness of the nature of work in a given group. 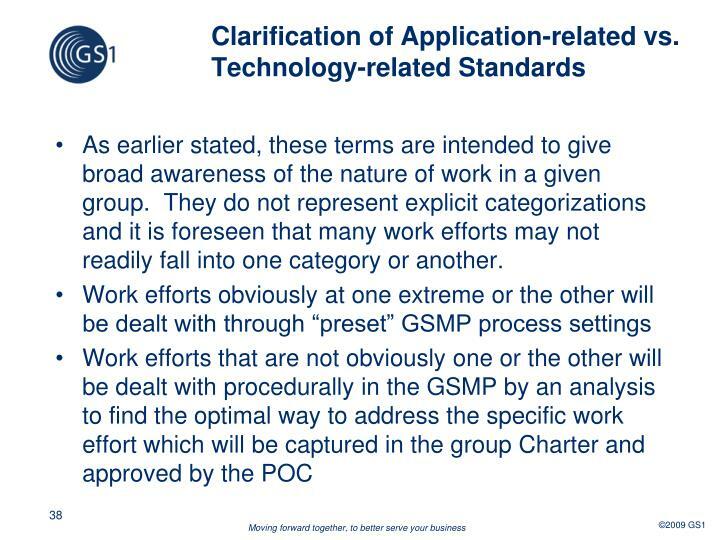 They do not represent explicit categorizations and it is foreseen that many work efforts may not readily fall into one category or another. 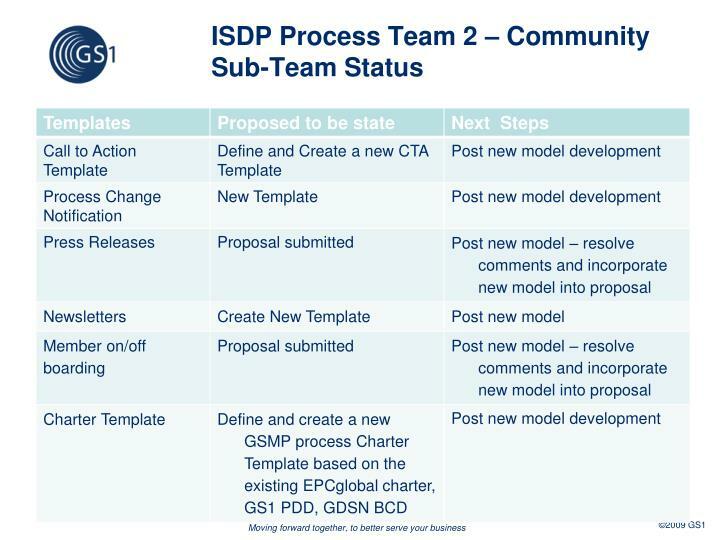 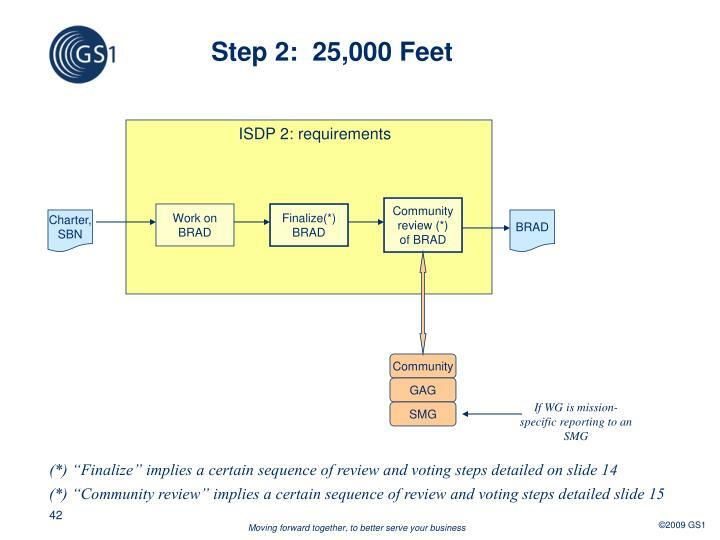 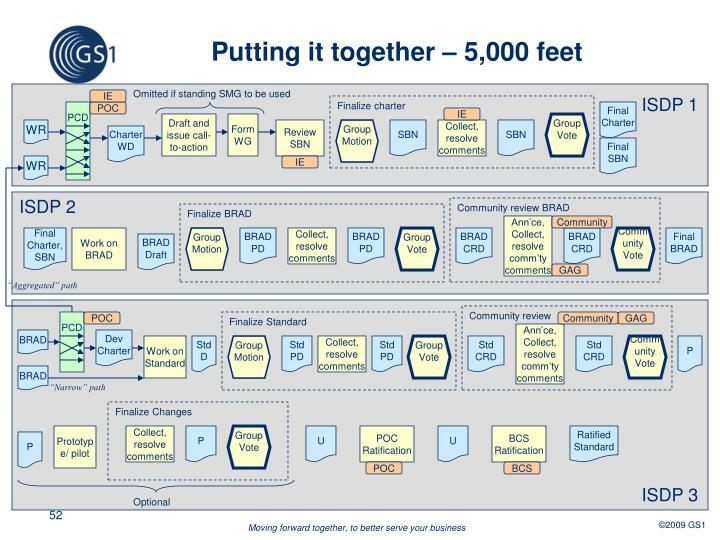 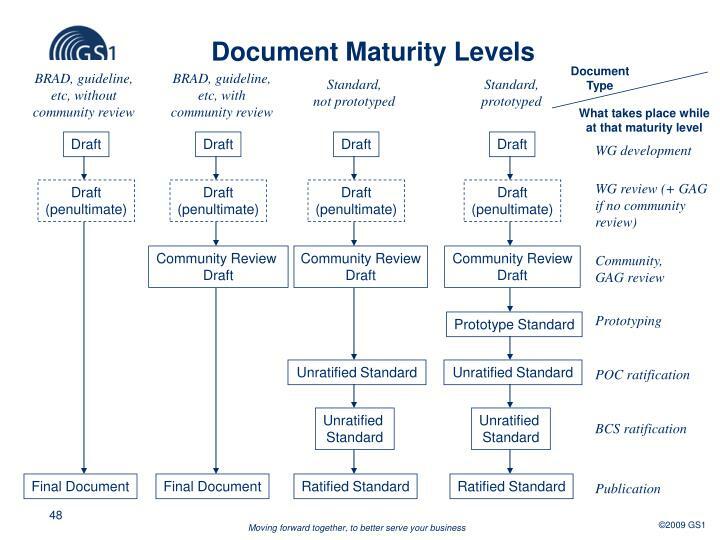 Should impact assessment wait until Step 4, or be done in Step 3 prior to the first community review of draft standard? 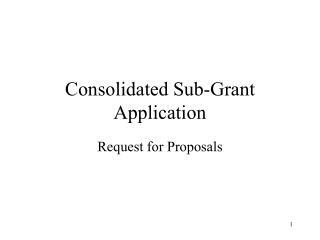 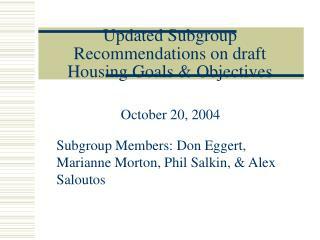 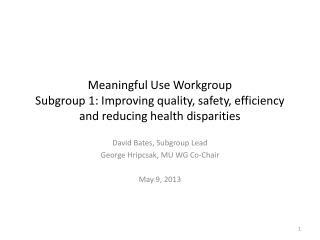 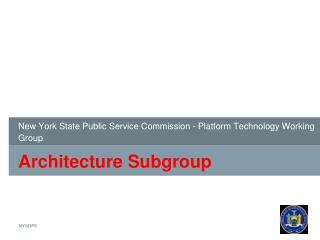 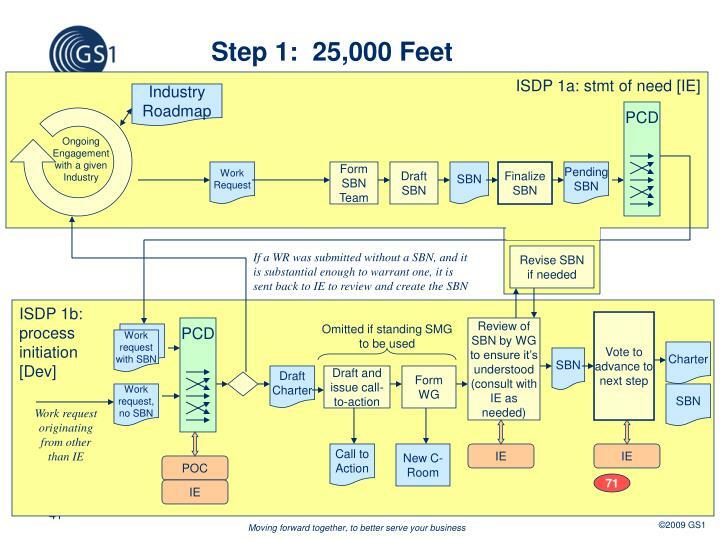 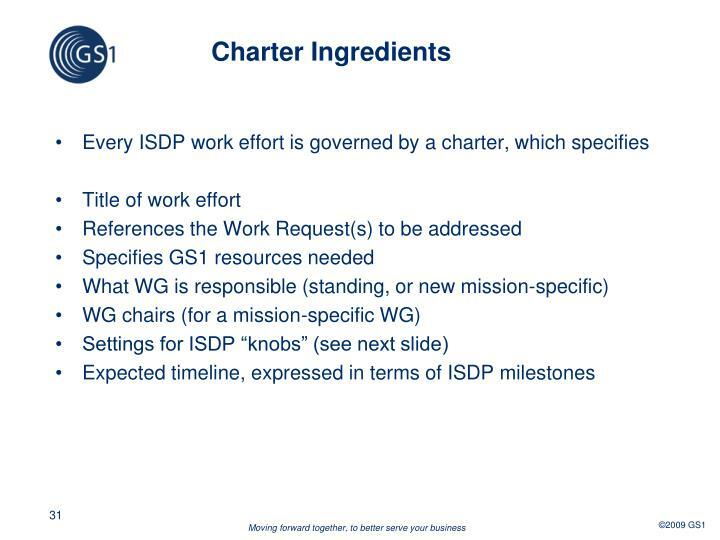 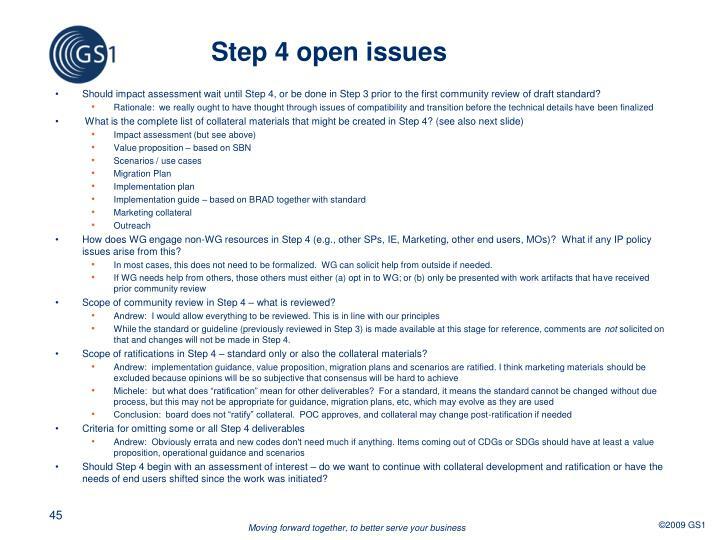 How does WG engage non-WG resources in Step 4 (e.g., other SPs, IE, Marketing, other end users, MOs)? 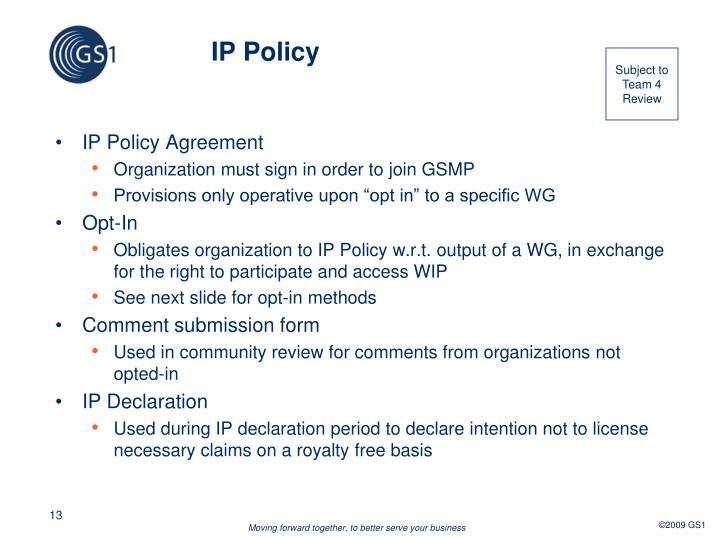 What if any IP policy issues arise from this? 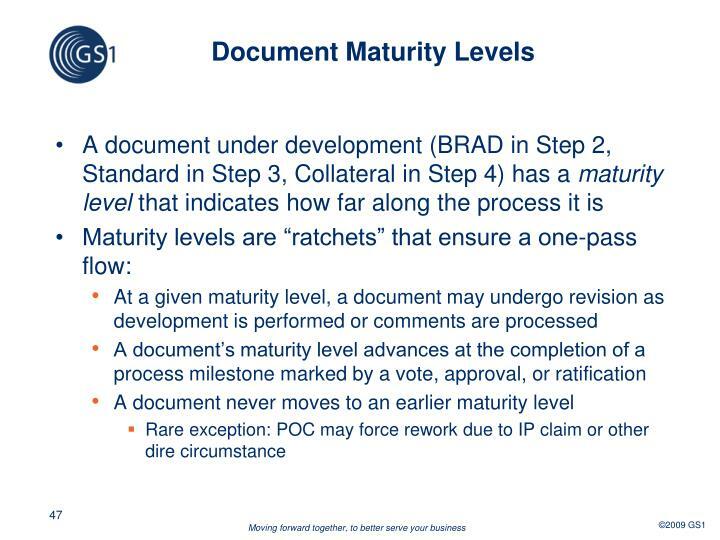 In most cases, this does not need to be formalized. 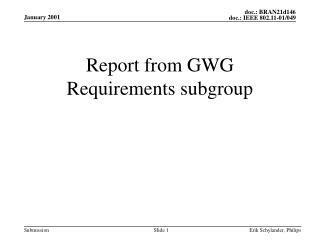 WG can solicit help from outside if needed. 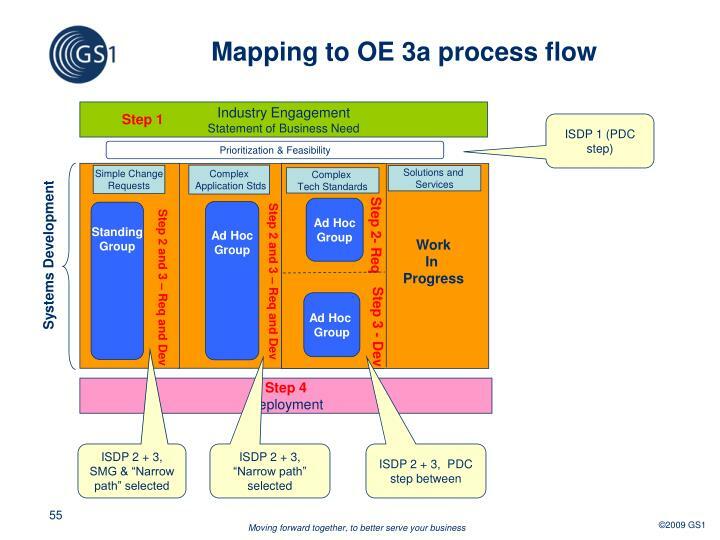 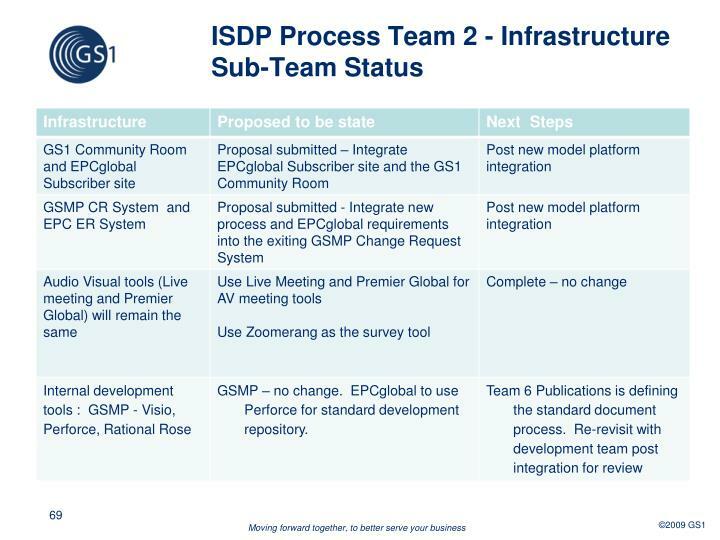 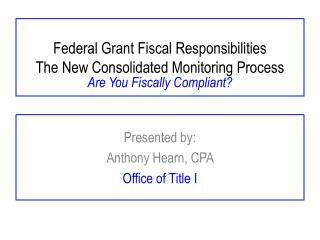 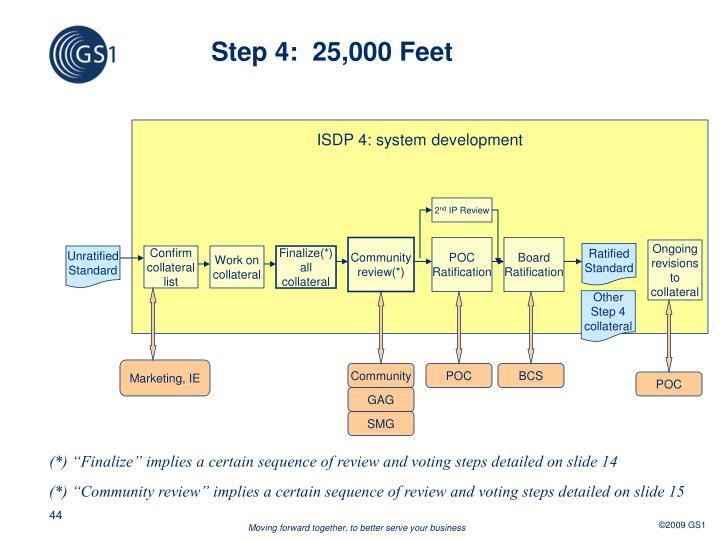 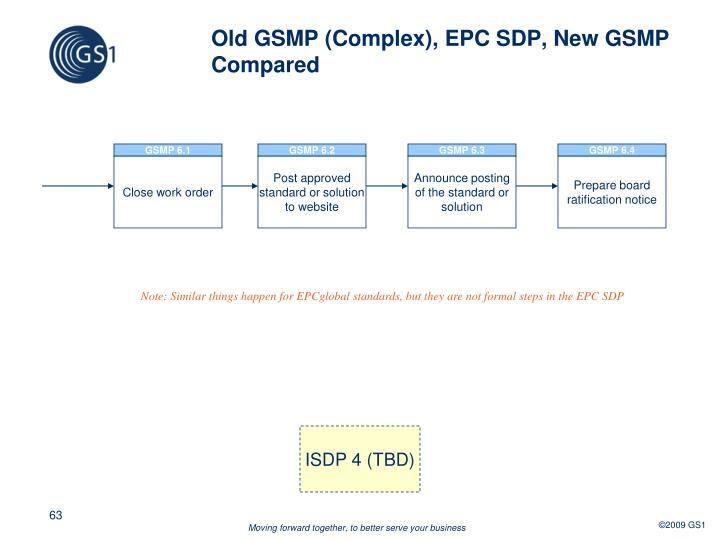 Scope of community review in Step 4 – what is reviewed? 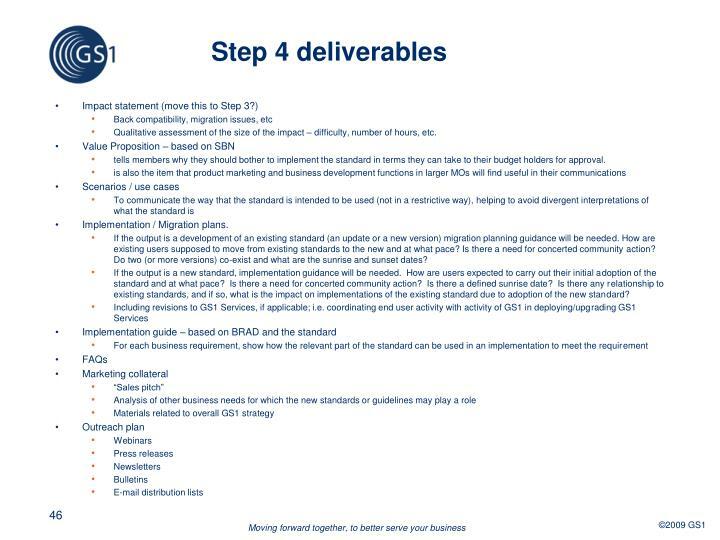 While the standard or guideline (previously reviewed in Step 3) is made available at this stage for reference, comments are not solicited on that and changes will not be made in Step 4. 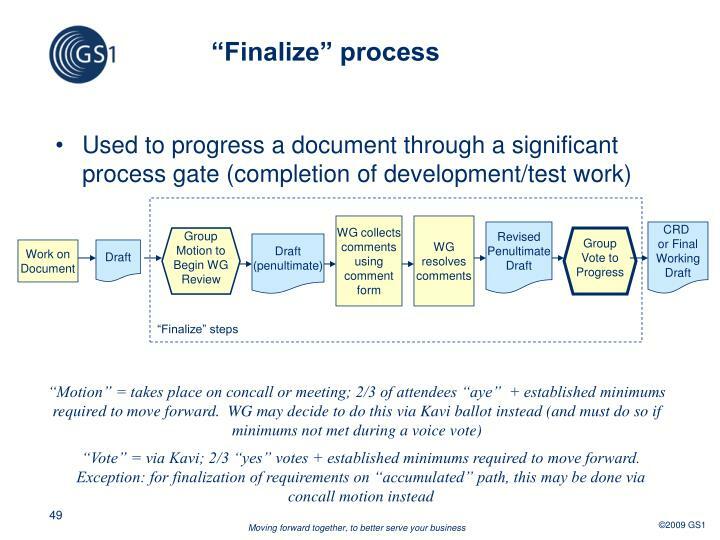 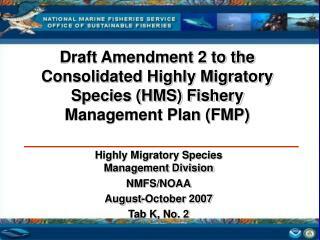 Scope of ratifications in Step 4 – standard only or also the collateral materials? 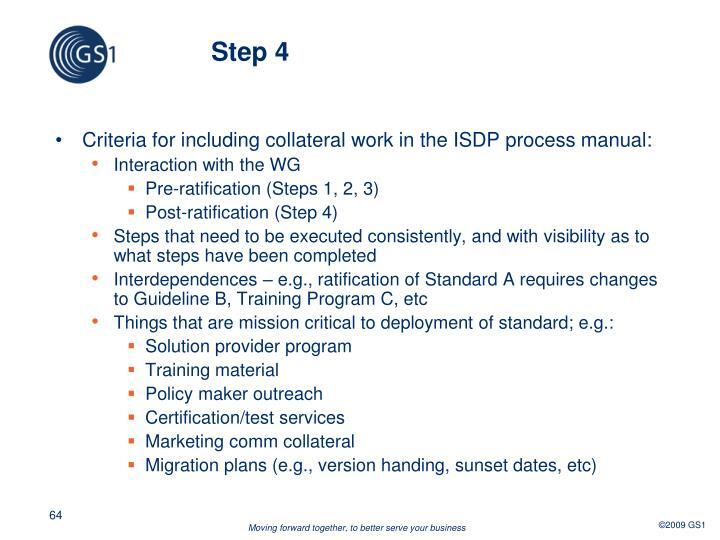 Should Step 4 begin with an assessment of interest – do we want to continue with collateral development and ratification or have the needs of end users shifted since the work was initiated? 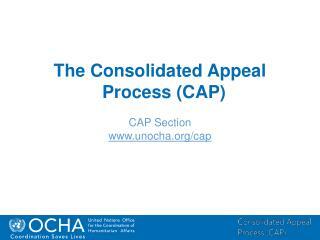 Qualitative assessment of the size of the impact – difficulty, number of hours, etc. 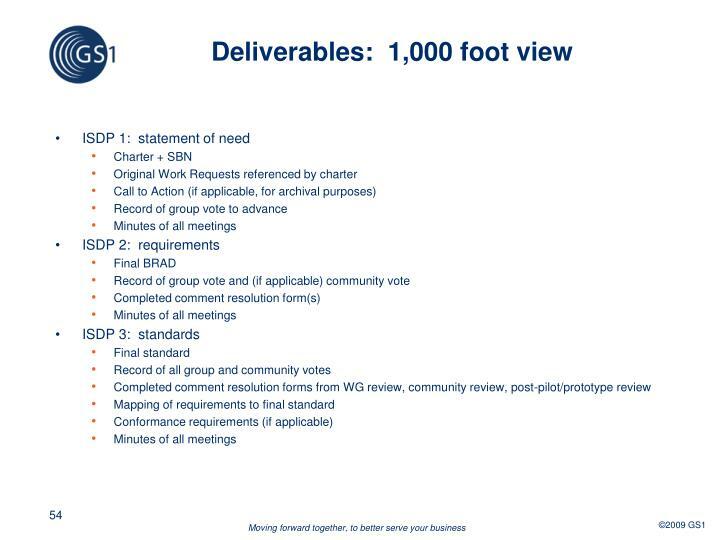 tells members why they should bother to implement the standard in terms they can take to their budget holders for approval. 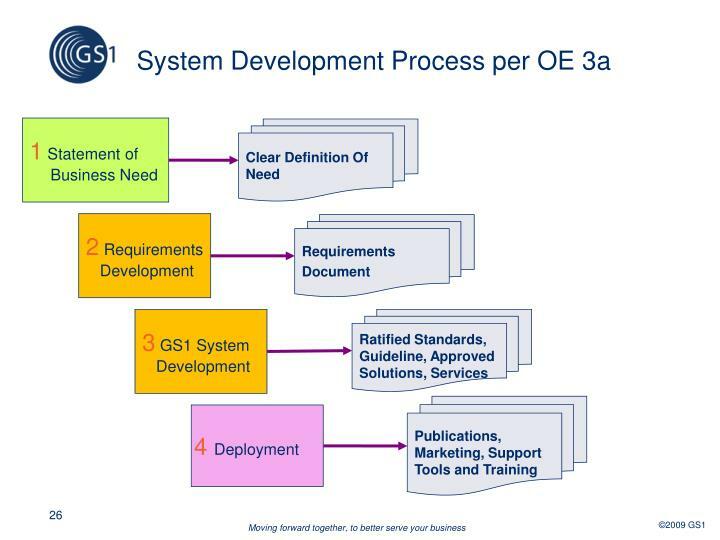 If the output is a development of an existing standard (an update or a new version) migration planning guidance will be needed. 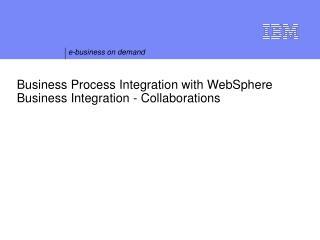 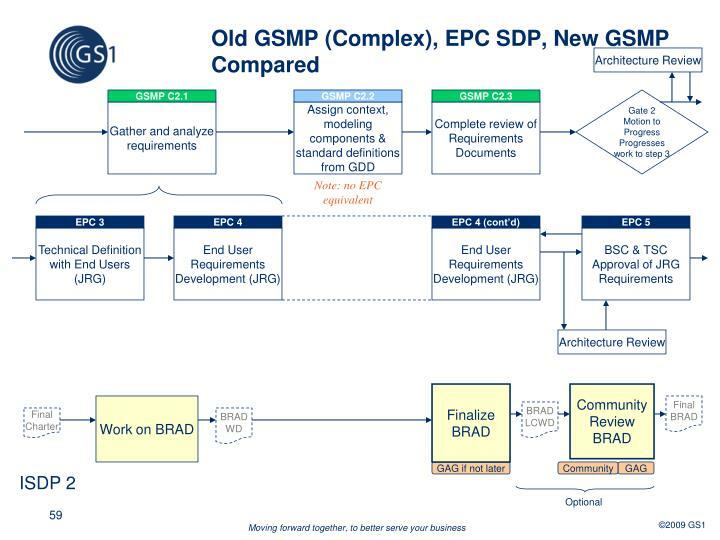 How are existing users supposed to move from existing standards to the new and at what pace? 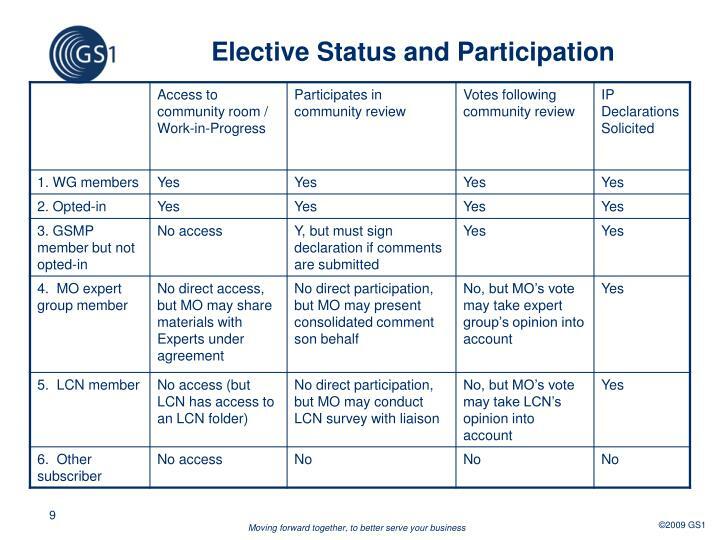 Is there a need for concerted community action? 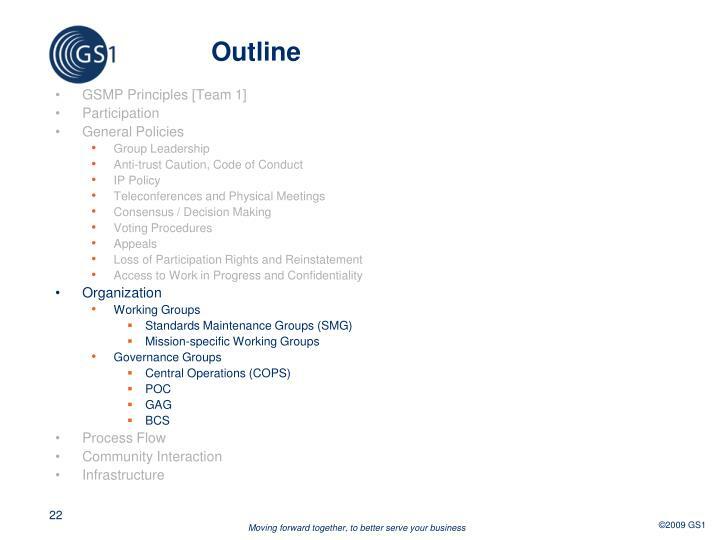 Do two (or more versions) co-exist and what are the sunrise and sunset dates? 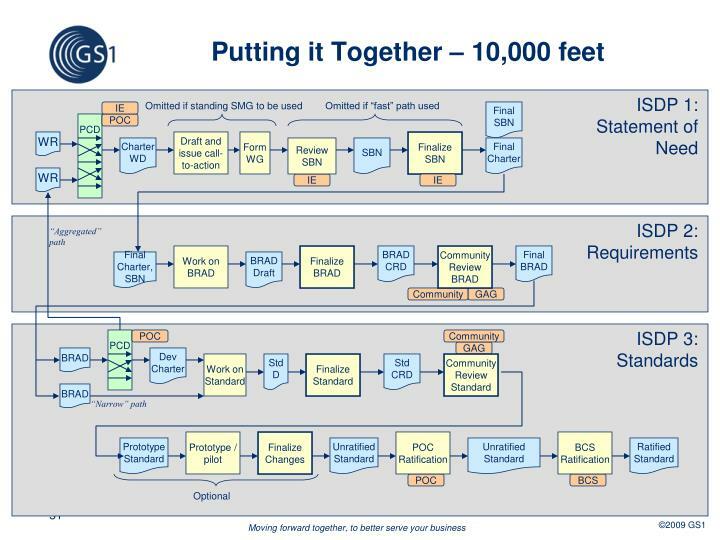 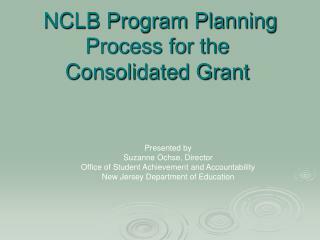 If the output is a new standard, implementation guidance will be needed. 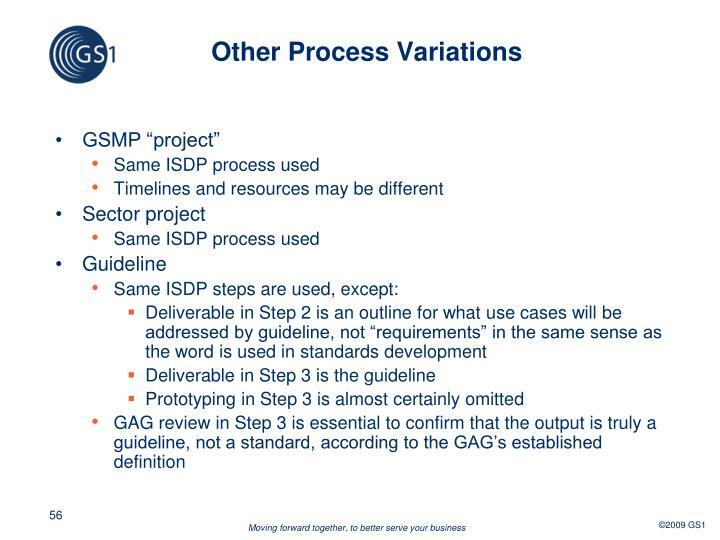 How are users expected to carry out their initial adoption of the standard and at what pace? 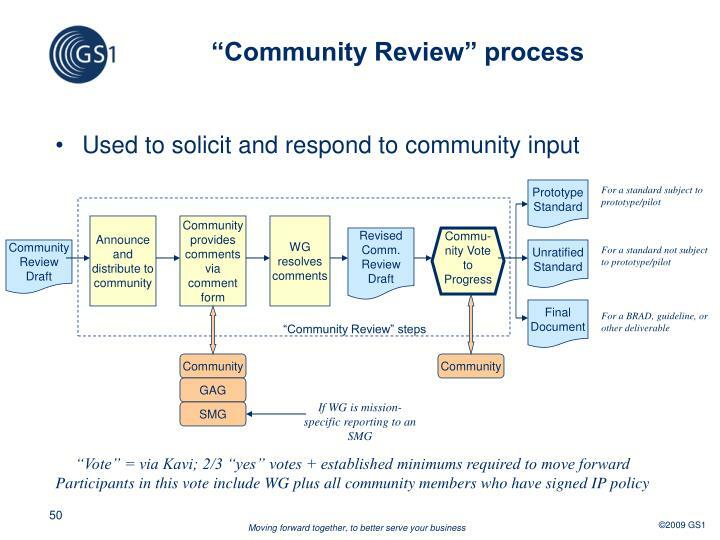 Is there a need for concerted community action? 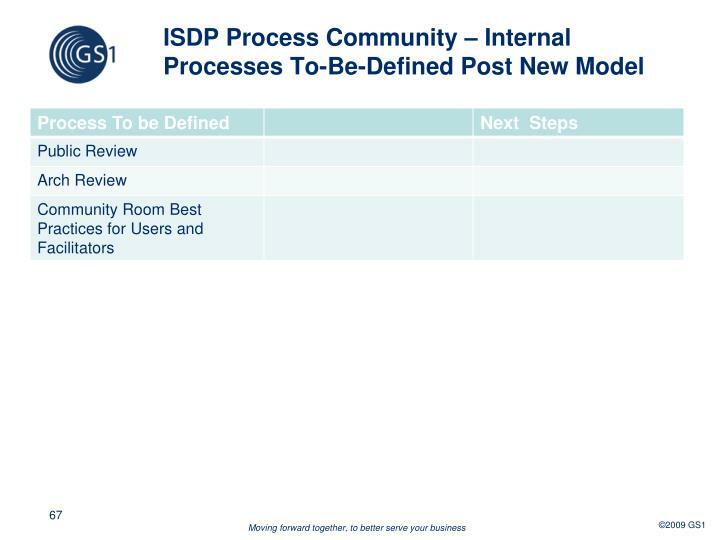 Is there a defined sunrise date? 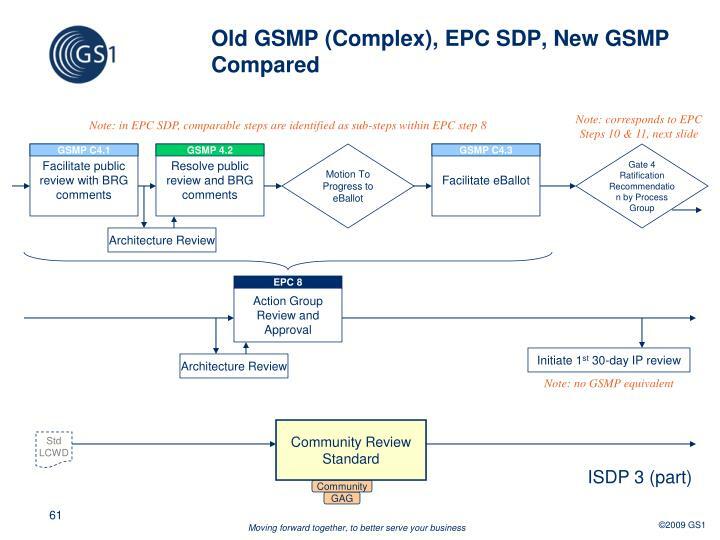 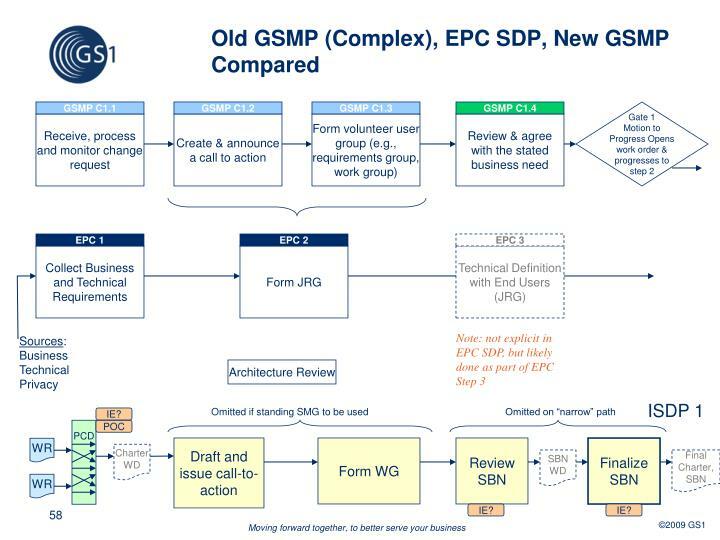 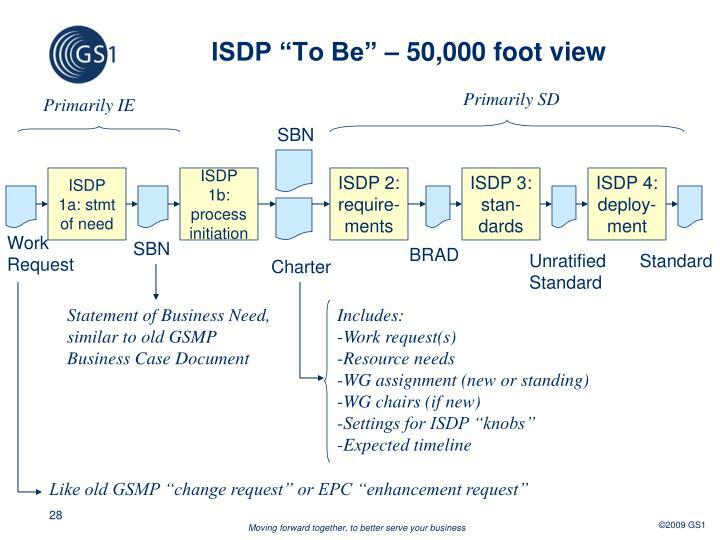 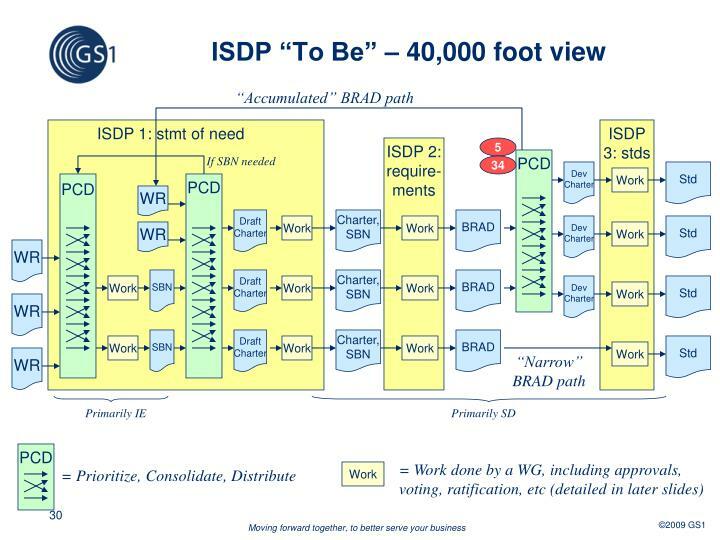 Is there any relationship to existing standards, and if so, what is the impact on implementations of the existing standard due to adoption of the new standard? 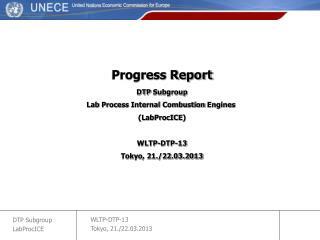 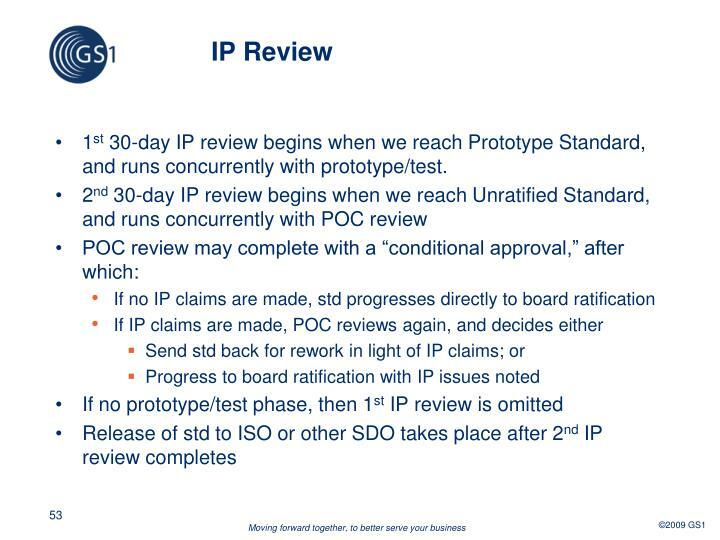 1st 30-day IP review begins when we reach Prototype Standard, and runs concurrently with prototype/test. 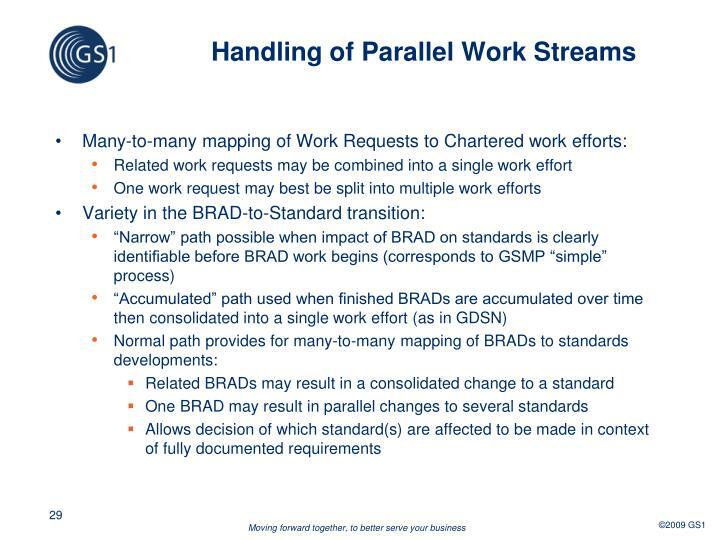 TBD: Criteria for when it is acceptable to specify the “narrow” and “accumulated” paths. 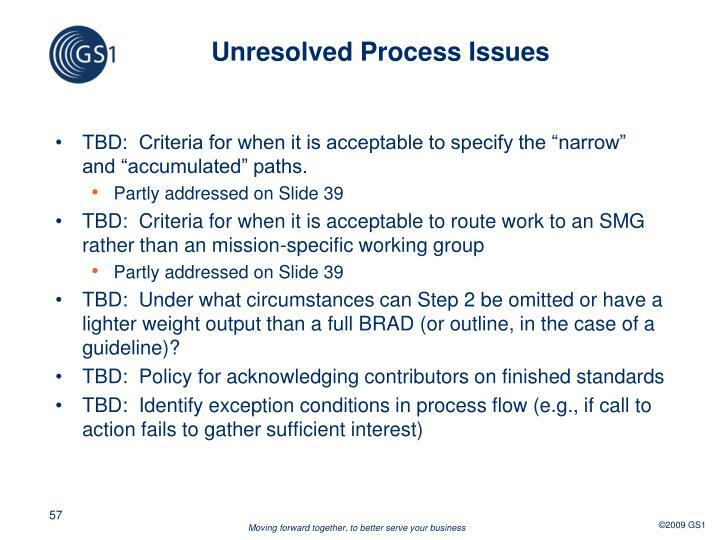 TBD: Under what circumstances can Step 2 be omitted or have a lighter weight output than a full BRAD (or outline, in the case of a guideline)? 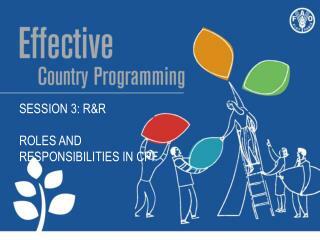 Session 3: R&R roles and responsibilities in CPF -Session 3: r&amp;r roles and responsibilities in cpf. 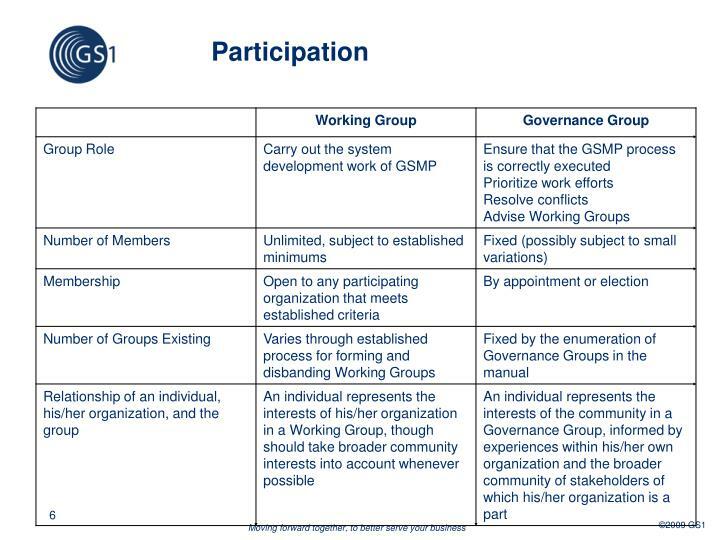 roles and responsibilities (cpf). 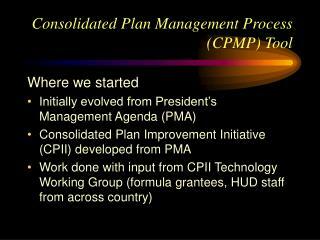 cpf formulation process. 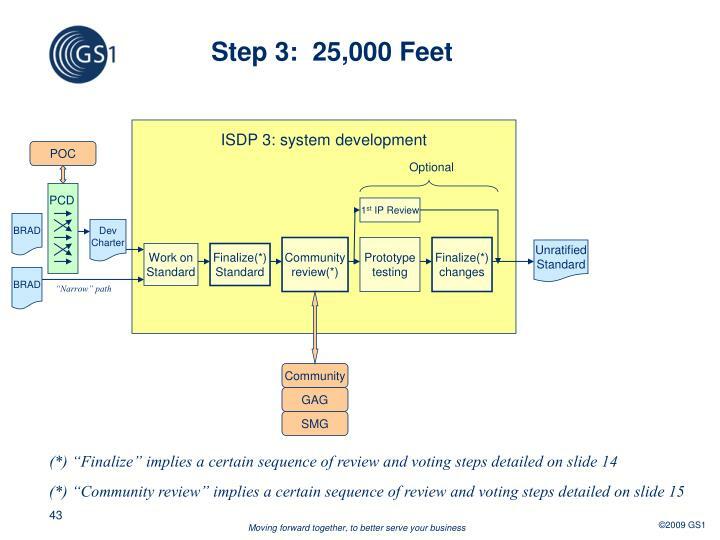 cpf endorsement process. 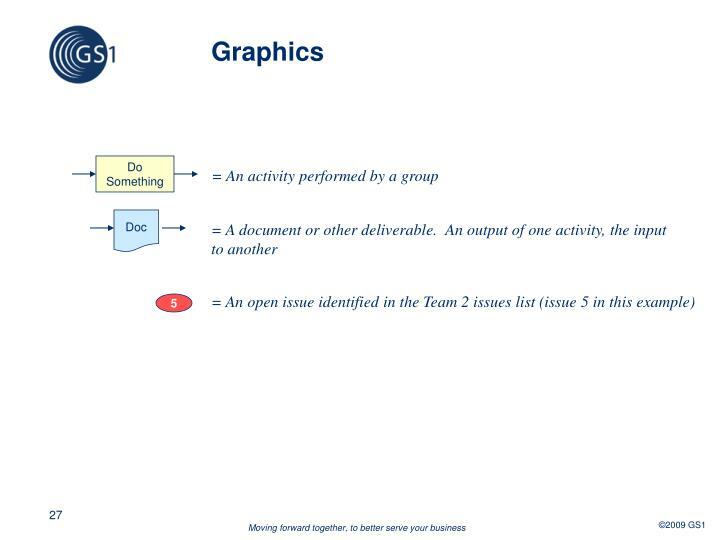 concept note. 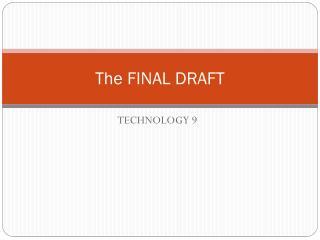 i draft - strategic.